1637, 1647: John Ellis, gent. In 1772 a survey of every house in the city was taken in consequence of the Mileways Act of 1771. Nos. 45 was then in the occupation of Mr Curtiss, and its frontage measured 9 yards 1 feet 9 inches. There was a narrow passage to the east of No. 45 leading to a long outbuilding: this was used as Billiard Rooms from before 1841 to 1889, and then by other businesses. In the 1840s, the shop at the front was divided into two premises, and the buildings at the back were numbered 45a and 45b. 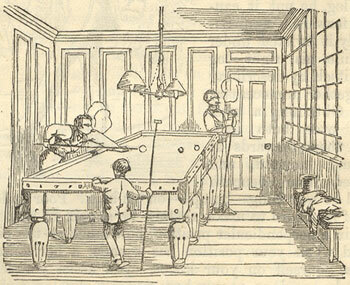 Left: Thomas Betteris’s upstairs billiard room in 1853, as illustrated in Cuthbert Bede, The Adventures of Mr Verdant Green. The 1851 census shows No. 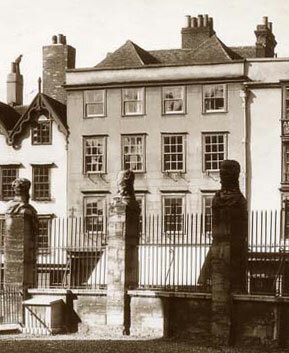 45 occupied by a widow, Charlotte Sheard, and her two young children: she is described as a wine merchant. It may be her son Edwin who later went into partnership of the billiard rooms. Also listed at No. 45 (presumably living in the building behind) was Thomas Betteris, described as a “Billiard Table Keeper” with his wife and son Edwin (who had the same occupation), his daughter, and a servant. Betteris had lived there since at least the time of the 1841 census, and was still there in 1861, by which time he had five children and two servants. Between 1876 and 1881 No. 45 only had a single occupant (at the time of the 1881 census this was was Aaron Thornton, an unmarried waiter of 49): presumably the building was undergoing alteration at this time, ready to reopen as a boarding house in 1882. From 1882 to 1889 John Chaundy & Son’s “ye old picture shop” was at 45b behind. In 1904 the Oxford Chronicle reports that the offices of the Electric Company that had been at the back “have been removed to the front premises in Broad Street, thereby offering to the public greater facilities of approach and convenience”. William Butler Yeats and his wife lodged here at No. 45 for two months from around the beginning of January 1918 before finding more permanent accommodation at 4 Broad Street. The situation here is complicated. From 1893 to 1904 Biddle Adams & Co. (tailors) are also listed at No. 45. It is possible that different parts of the complicated premises were numbered 45a and 45b at different times.